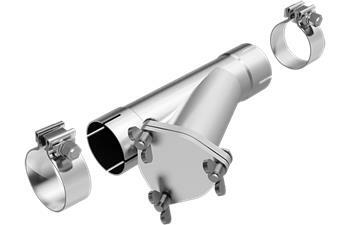 MagnaFlow Exhaust Fabrication Components UNIVERSAL - Dezod Motorsports Inc - Home of the automotive performance enthusiast since 2002. When you’re at the racetrack and you’re looking for that slight performance edge, MagnaFlow’s exhaust cut-outs are the ideal solution. Instead of going through the hassle of removing your existing exhaust system, the addition of a MagnaFlow cut-out allows you to easily “uncork” your motor, by giving the exhaust gases a way to bypass the remainder of the exhaust system after the point where the cut-out is installed. By opening up the exhaust cut-outs, you’ll be releasing back-pressure and, in return, see maximum gains in horsepower and torque.